Need to get your people back to work quickly? Tired of putting out fires with your office staff and wasting your valuable time? We provide Remote Help desk and on-site support. Our polite and professional help desk technicians can talk you through or remotely access your PC, with your permission, to resolve any technical issues you may have. What happens when your IT guy misses a day of work? 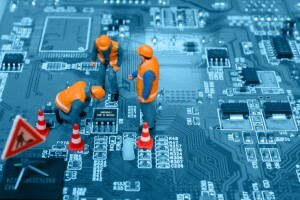 Should your business come to a halt because of a technical issue? When you call our help desk, you will always get a live answer and a timely response. EMSCO Solutions employs a comprehensive and integrated help desk and ticketing system that helps our IT professionals easily track and resolve issues quickly. And since EMSCO Solutions is a whole team of IT guys, you benefit from the combined knowledge of technicians who are not only experienced, but also have access to a vast archive of our successful procedures and solutions that can be applied to your specific issues. When an issue can’t be resolved via remote support, we will quickly send one of our technical specialists. For our clients with remote locations outside our dispatch zone, we will call on one of our technical partners. For our clients in the Oklahoma City area, there are no additional charges or “trip fees” for an on-site visit. We do not charge a 1-hour minimum for any of our customers that purchase pre-paid non-expiring Time Blocks, which are used on an as-needed basis and are billed in 15-minute increments. On-site appointments involve a thorough checklist, which has evolved since 1993. The reason for this checklist is to ensure the appointment runs quickly and efficiently, and the customer is made aware of the project’s status and the results after completion. This process ensures that the customer experience remains the same even with a technician different from that of a previous call. The technician will review a checklist to make sure all items have been reviewed. Additionally, the technician will review the client’s previous history of related issues from our client ticketing system. All on-site call worksheets and support tickets will have detailed information about every call and visit. This information is provided with your invoices and easily researched in our database.